As a performer, Sarah Granskou is a scald, applying her Canadian sense of innovation to Scandinavian oral traditions. While Sarah draws on ancient art forms, her work is accessible today, based in contemporary experience as well as her interpretations of Nordic folklore and music. Sarah’s tapestry of poetic narrative and song lyrics provide a moving and humourous context for 8-string fiddle, mouth harp and innovative puppetry. As a textile artist, Sarah works with wool, using wet felting and needle felting techniques to create puppets, hats, shoes, clothing and more. 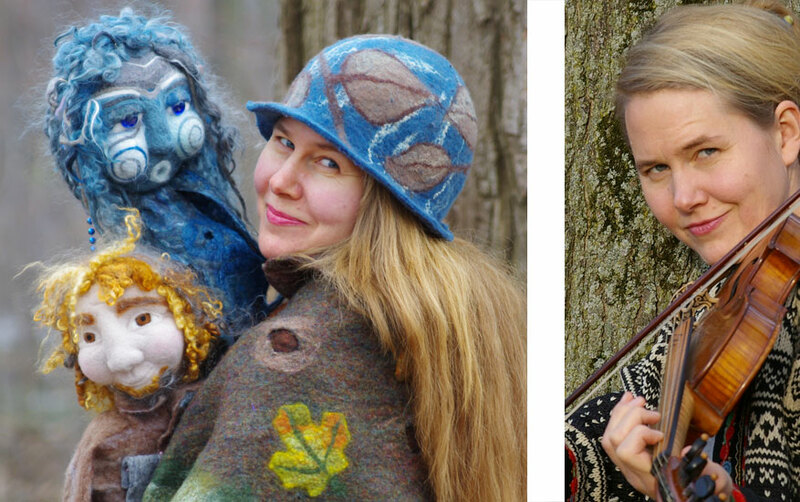 She began felting more recently, as a means of creating puppets for performance and has been entirely smitten with the artform, now processing her own local and Canadian wool with natural and accessible dye sources. Sarah was the 2016 Artist in Residence for the City of Kitchener. She currently collaborates with musicians Trevor Ewert (violin) and Amy Scott (keyboard) and puppeteer/musician, Joel Brubacher. Growing up, Sarah’s awareness of her heritage manifested in food traditions, a few Norwegian swear words, and an imitation Sami hat which was worn on birthdays. Granskou’s first profound experience in Norway was, in fact, amongst the Sami reindeer herders of the North, where she learned their wordless singing. Then, with her great-grandfather’s fiddle in her backpack, Sarah traveled extensively on ski, hut-to-hut in southern Norway. Upon exposure to the music and stories of her ancestry, she responded through what she calls a “genetic memory”. Working on farms in Norway, she learned traditional music and hand crafts, becoming involved with the people on a personal level. Sarah has since studied Norwegian folk music independently and with the support of the Canadian Council for the Arts and the Ontario Arts Council. Sarah’s varied background in theatre, with such companies as Theatre Newfoundland and Labrador and The Edinburgh Puppet Company, has also inspired her solo performance career. Since 2000, Sarah has presented musical story theatre throughout North America on extensive performance tours. Her evolving performances have reached hundreds of community and school audiences. She was featured for the opening of the Viking exhibit at the Museum of Civilization, and as an opening act for such musicians as Oliver Schroer. Sarah’s works have been released by Ensemble Polaris on the album Midnight Sun, aired on the CBC and through national media in Norway. Sarah was chosen to represent the Storytellers of Canada on a school tour with the 2007 Children’s Book Week. She collaborates with the K-W Symphony in their Kinderconcert series, and has been featured in the symphony’s school series, performing an interactive musical story with puppetry. Sarah was the 2013 Folk-Artist-in-Residence at the Joseph Schnieder Haus, a historical museum in Kitchener. She freelances as an arts educator, leading programmes integrating music, puppetry and oral literacy, and having been funded by the Ontario Arts Council from 2010 to 2017. In 2014, Sarah collaborated with community children in creating puppets, music and story theatre for the Story Machine project, which has performed at several festivals.